Dark woods and exotics make a comeback in laminates. What's new in the world of decorative laminates? Plenty. Dark woods and exotics, metals, granites, marbles, bold colors and other interesting patterns - even a '50s classic - make a return. The news for 2005 in the wide world of decorative laminates is that designers and laminate manufacturers seem to be offering something for everyone. Laminates provide low-cost, high performing alternatives to natural materials for a myriad of applications ranging from residential kitchens and baths, storage, furniture and flooring to commercial, retail, hospitality, institutional, educational, casinos, fixtures and more. 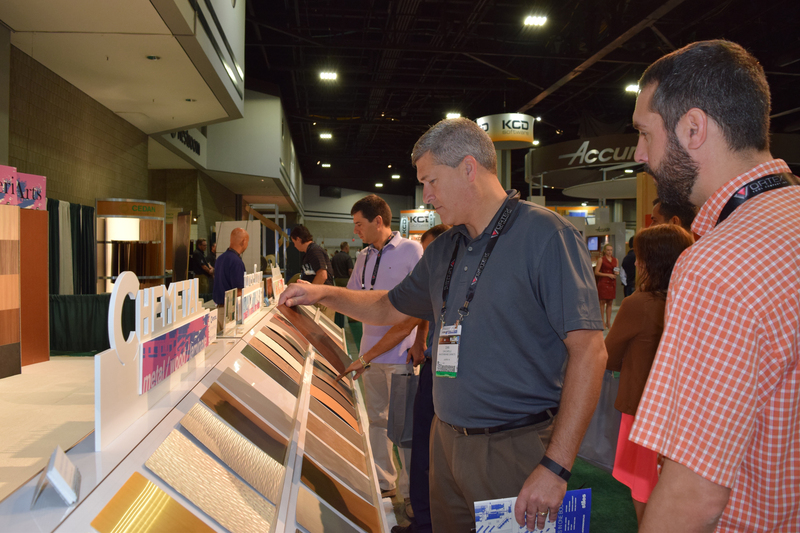 Wood & Wood Products polled members of the laminate industry to determine what's new, what's hot, and what market segments might be growing. Formica Corp. of Cincinnati, OH, is launching a variety of new looks this month, along with the return of some popular classics, says Gerri Chmiel, senior design manager for the company. Among the offerings are two new textures. "Naturalle is a low-gloss, low-sheen wood grain texture that's almost a hand-rubbed, waxed wood finish with light ticking," Chmiel says. The second finish, MicroDot, is a low-sheen finish with subtle concave circles in a tight grid formation that adds texture and shadow to solid colors. Formica is also bringing back some classic favorites, including the very popular Boomerang, first introduced in 1950 and reissued in 1988 for the company's 75th anniversary, and VirrVarr, created in 1958. Nevamar, based in Odenton, MD, is showing Sasanami, inspired by the precious metal used in Japanese jewelry, says Charlotte Zang, of Nevamar's ad agency, Mullin Ashley. "This pattern is a mix of gold, silver, copper and blue, a contrast in harmony - warm versus cool." Nevamar's new woodgrains include the exotic bubinga, a rich, brown-red; Kendo, a bamboo-inspired pattern the company says will fit in well with inside/outside living trends; and the Labyrinth wood grain series, similar to rattan or a loosely woven textile. "We are doing well with maples and cherries," says Frank Densmore, design manager for Coveright Surfaces, headquartered in Cobourg, ON. "Maples and other blonde woods aren't in the fashion showrooms, but are huge volumes, near commodity levels with manufacturers. No one is promoting maple. It's sort of 'Seen it, been there, done that.' The pendulum 'swing' for woodgrains is going darker in general terms." In addition to darker wood tones, Densmore says oak is ready for a comeback. "It's a great hardwood and people love it. We have added five new oaks to our line since the end of the year, ranging from a light blush to chocolate brown, and a charcoal grey with a white-filled ticking, giving almost a leaded effect." Woods with a glazed furniture look, or the oiled patina, reminiscent of the American made furniture from the Southeast, will be important, Desmore says. He also sees growth coming from prints rather than solids in melamine. "Look at closet and organization, an exploding sector. Ten years ago they were in the position where 60 to 80 percent was white carcassing. Today, it has flip-flopped so that 70 to 80 percent of melamine in closets is woodgrain." WilsonArt's Antique Roca collection, with its "tumbled marble effect" in patterns with a honed finish and soft natural tones, is geared to the residential market. Brenda White, public relations coordinator for Wilsonart International Inc., of Temple, TX, says the series introduced in mid-2004 has proven popular with residential and commercial markets. "Roca, a tumbled marble effect in patterns with a honed finish and soft natural tones, is geared to the residential market," she says. "Oasis, reminiscent of fractured glass, stained glass, mosaic tile, even the veining in leaves, features three patterns and is geared to the commercial market. Fusion, geared to residential, but with commercial appeal, offers a marbleized effect in chocolate tones, blue with black and green along with aqua and blue tones." WilsonArt will launch its next new line in July. "Printing technologies have improved so much over the past 10 years, and printing fidelity is now so much better that the challenge is to pair a specific look with the best finish." Matte finishes have been replaced in some cases with textured block finishes for a flat surface with depth. For commercial applications, White says designers typically do not want reproductions unless it is for wood grains. "We offer many looks that are influenced by many things such as textiles or stones, a unique pattern versus a copy of something." Leslie Schaefer, vice president of marketing and owner of Easthampton, MA-based Chemetal, says she is seeing a softer palette with tints put on the topcoat and brushed-on patterns. "It gives an almost holographic quality and a lot of eye appeal. We do a lot of work in casinos and nightclubs and the accent of color offers high energy with a lot of visual presence. "Tint/color provides a relatively inexpensive visual accent with a lot of unique properties that you don't get with just a stain. We introduced it to the market at the beginning of the year, and it's done very well," Schaefer says. Silvery aluminums are also popular now. "There's also an interest in looks that go with the arts and crafts styles, painted metals, chemically etched in-house as well as textured and embossed metals. When it comes to brass, the bright, shiny look has been replaced by the antique brass look," Schaefer says. From a color standpoint, Jim Barnett, marketing manager at American Renolit, sees a lot of low-gloss, satin texture wood grains in demand now. "We call them our S-Coat and the effect is to take the plastic look away." In kitchen environments, Barnett says the mix-and-match approach is gaining popularity. "For kitchen cabinets, instead of using all one species or color, we see designers and consumers using all sorts of interesting combinations, like a cherry with silver or an antique white teamed with a dark color or chocolate-stained wood color. Lots of combinations are popular in kitchens. Maybe the island is one color and the cabinets another, or you team a big cabinet in chocolate maple with a smaller cabinet in antique white." stainless, but give a nice clean appearance." Also popular is "pearlescent" wood grains. "The light hits it and reflects. When used with woodgrains it gives a more natural look similar to a natural occurring luster." Barnett said the look is popular anywhere woodgrains are being used, especially kitchens and closets. This Parqwood veneer floor from Abet Laminati is available in 10 exclusive wood grain colors. Tony Damiano, president of Abet Laminati, Englewood, NJ, says laminate designers and manufacturers face a variety of challenges from today's clients. "It isn't enough to show new colors and patterns. Designers want us to help them solve problems. We know our clients hate the traditional seam you get with a laminate, but it's very hard to avoid. One of the solutions we are providing is a crossgrain wood grain, where the oak pattern goes across the sheet. This allows designers to specify the fa+ÃâÃÂºade of a store fixture, for example, allowing applications of up to 10 feet with no seam." Damiano says Abet also addressed the brown line that appears when laminates are together on a 90ÃÂ° angle. "We put black craft paper under our darkest colors. When you have navy blue, deep charcoal, or any deep color, you don't see the brown." product composed of the dust generated when you sand the back of a laminate, mixed with non-virgin polypropylene to create a new surfacing product. We first issued black but are adding seven colors." residential is "Granite, granite and more granite. It seems there is nothing else consumers want on their countertops. The look has to say it came from the outdoors and looks like real materials. You can't fool with faux looks, they want a natural, honest look." Other new looks include solid colors with pearlescent printing. "It is a process that allows our customers to impregnate and treat the paper with minimal problems. In the past, pearlescents had a mixed reputation because of some problems with streaking or disorientation from the paper." Chocolate and cherry shades show continuing popularity in furniture, as are distressing, antiquing, hand-rubbed and burnished looks that appeal and fit in with the casual, homey styles. Also making inroads are "bright, vibrant colors, such as jatoba reds and oranges and mahogany reds." Mark Smith, senior design manager for Schattdecor/DÃÂ©cor USA, St. Louis, MO, says new offerings include the pattern Zeno, "a little line pattern almost like a textile, but with a retro look, too. Murano, another new look, is an interesting design that is best described as a water look." Both will be available in a wide range of colors. "A blue-green mix is one color combo used in Murano," Smith says. "We think blues and greens are coming back." exotic woods as important elements for certain markets. "Techno Rustic is another design category. It's about the combination of new technology with aged or rustic elements, or using finishes that give an aged look to a new surface." Spas and vacations are other influences. "Spa might mean using softer colors, diverse elements in harmony and the comfort woods - raw, unfinished and weathered. It's also seen in the pearlescent look, which can be metallic yet translucent, like water and metals." Vacation is about lights and glitz but also the use of exotic woods, especially true-to-life laminates that offer the look but not the price, Smith says. "Cherry continues to be an important look," says Christian Tremblay, marketing coordinator for Tafisa Canada, based in Brossard, QUE. "Exotic woods like zebrawood and etimoe, along with a number of new patterns and colors are new for our company," Tremblay says. Tafisa's thermally fused melamines are used for a variety of markets, including kitchen and bath cabinetry, residential furniture, store fixtures and office furniture. "Fifteen or 20 years ago, if you were talking about TFM or melamine, you would probably be discussing solid colors. Today, we are expanding our line of woodgrains. A big look in the past three years has been cherry patterns. In the last two years, Tafisa has launched 15 cherry designs. This year, we see exotic woods growing in popularity." cabinetry industry. 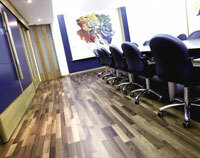 RTA furniture is probably the second largest market for melamine, followed by office furniture. Tremblay says Tafisa hopes to make serious inroads into the store fixtures arena as designers substitute TFM for applications "that don't really need the higher-priced HPL." Jennifer Carley, market analyst for CDM Papers and Foils, Drummondville, QUE, comments that in residential furniture, cabinetry and home storage applications, "The dark tones are big this year - especially from brown and espresso colors, almost to black. This was an expected trend. The light cherries are new and popular for many applications, both commercial and residential. Cherries, exotic woods and straight-grain oaks are very popular. Walnut is also increasing in popularity." Carley says the rustic look, showing wormholes and sap marks, continues to be popular in all categories. For cabinetry, hickory seems to be the new favorite. "Another big trend is painted wood with the wood grain showing through. This gives a cottage feel to the designs." CDM's Heirloom Maple and Reflections are examples of this look. For closets and home storage, light maple remains popular; Carley sees maple and cherry as standouts from the wood looks, in tones that range from medium to dark for middle to high-end segments.